Stem-like prostate cancer (PrCa) cells, also called PrCa stem cells (PrCSCs) or PrCa tumor-initiating cells (PrTICs), are considered to be involved in the mediation of tumor metastasis and may be responsible for the poor prognosis of PrCa patients. Currently, the methods for PrTIC sorting are mainly based on cell surface marker or side population (SP). However, the rarity of these sorted cells limits the investigation of the molecular mechanisms and therapeutic strategies targeting PrTICs. For PrTIC enrichment, we induced cancer stem cell (CSC) properties in PrCa cells by transducing three defined factors (OCT3/4, SOX2, and KLF4), followed by culture with conventional serum-containing medium. The CSC properties in the transduced cells were evaluated by proliferation, cell cycle, SP assay, drug sensitivity technology, in vivo tumorigenicity, and molecular marker analysis of PrCSCs compared with parental cells and spheroids. After culture with serum-containing medium for 8 days, the PrCa cells transduced with the three factors showed significantly enhanced CSC properties in terms of marker gene expression, sphere formation, chemoresistance to docetaxel, and tumorigenicity. The percentage of CD133+/CD44+ cells was ninefold higher in the transduced cell population than in the adherent PC3 cell population (2.25 ± 0.62 vs. 0.25 ± 0.12 %, respectively), and the SP increased to 1.22 ± 0.18 % in the transduced cell population, but was undetectable in the adherent population. This method can be used to obtain abundant PrTIC material and enables a complete understanding of PrTIC biology and development of novel therapeutic agents targeting PrTICs. Yiming Zhang and Yiqiang Huang contributed equally to this work. The online version of this article (doi: 10.1007/s13277-016-5046-6) contains supplementary material, which is available to authorized users. This study was supported by scientific research grants from the Pearl River Nova Program of Guangzhou (No. 2013J2200044), the National Natural Scientific Foundation of China (No. 81101559). 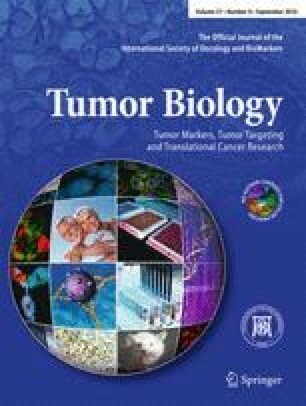 This work was supported by Grant  163 from Key Laboratory of Malignant Tumor Molecular Mechanism and Translational Medicine of Guangzhou Bureau of Science and Information Technology; Grant KLB09001 from the Key Laboratory of Malignant Tumor Gene Regulation and Target Therapy of Guangdong Higher Education Institutes.